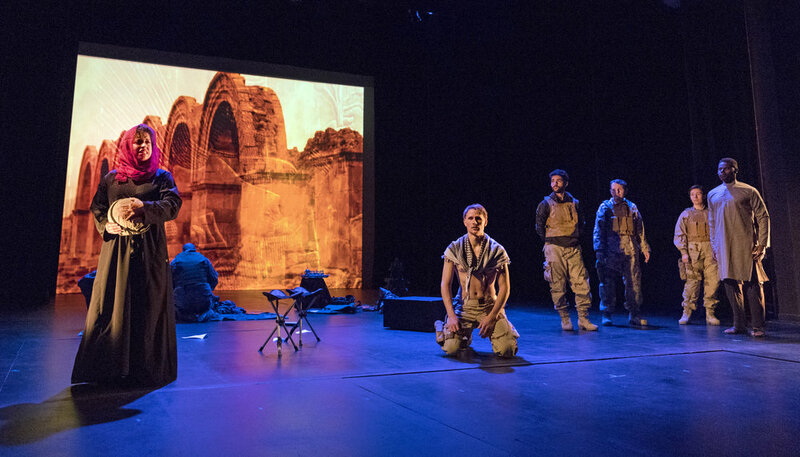 Aquila Theatre and American combat veterans of the Warrior Chorus collaborate on a unique theatrical experience, setting epic scenes from Homer, Greek drama and literature alongside compelling questions on modern democracy. What does democracy mean? What kind of democracy do we want to live in? How do we preserve and protect the democracy we have? 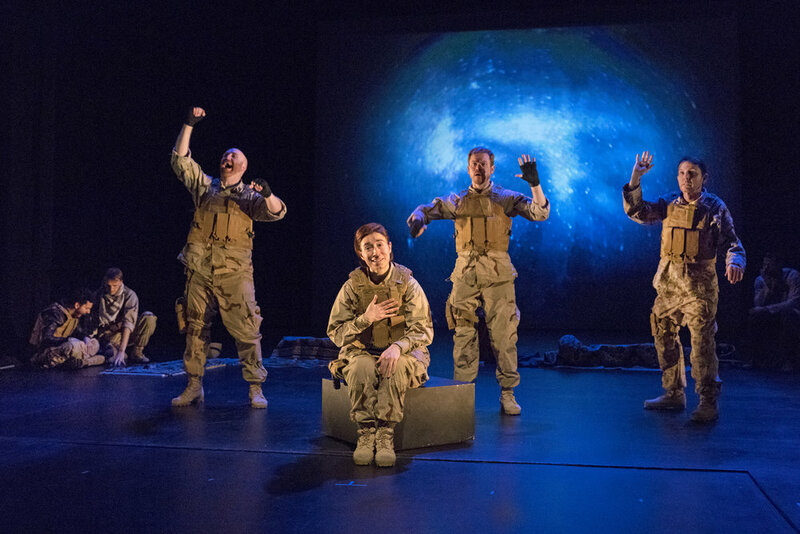 Aquila Theatre also held veteran-led Warrior Chorus workshops at many of the tour stops. 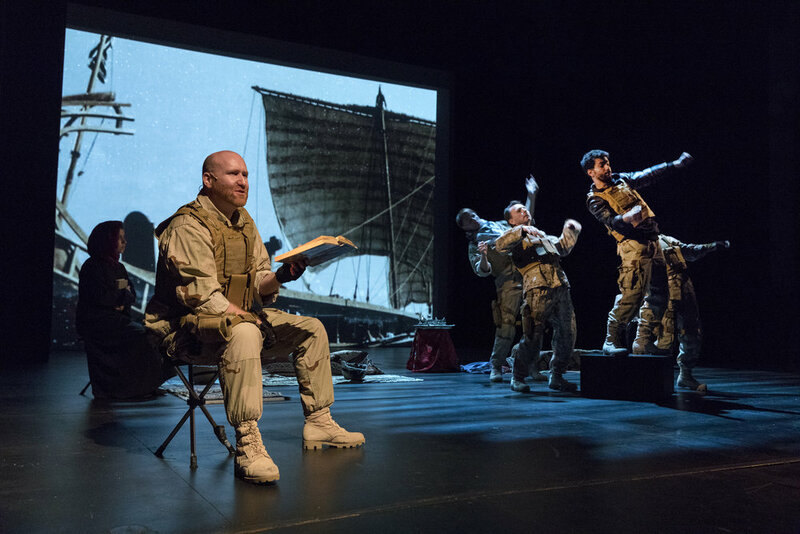 Using classical texts like The Iliad and The Odyssey, these workshops are meant to encourage a deeper level of understanding between the veteran and civilian communities and provide tools to generate honest and necessary discussion through the power of storytelling. Workshops are open to active members of the military, veterans, spouses and significant others, parents, high school and adult-aged children, and anyone who wishes to gain a better understanding of the military community. the Fishman Space at the BAM Fisher April 19 - 23, 2017. James “JB” Becton (U.S. Army) couldn’t be more ecstatic to be part of such a unique experience. He is a United States Army Veteran, enjoying the process of exercising his craft as a member of the Warrior Chorus. He has studied Shakespeare and Chekhov through Stella Adler and feels right at home with the classics like Antigone and The Iliad. This is his first production with Aquila Theatre Co. and he feels he’s found a new home. JB would like to thank Desiree for literally plucking him from the street, his fellow Veterans, for being Veterans and to you the audience for lending your eyes and ears. James Lavender (Performances: TX and CO) trained at Rose Bruford College of Theatre & Performance in Kent, UK. He has appeared in many Aquila Theatre performances, including: Murder On The Nile & Much Ado About Nothing (2017) The Tempest & Wuthering Heights (2014-15); A Female Philoctetes (2014); Twelfth Night & Fahrenheit 451 (2013-14); The Importance of Being Earnest & Macbeth (2011-12); As You Like It & An Enemy of the People (2010). James' other theatre credits include: Henry V (Antic Disposition); Much Ado About Nothing (Lord Chamberlain's Men); Cinderella, Peter Pan & Jack & The Beanstalk (Sheringham Little Theatre); Adventures in Wonderland & Supermarket Shakespeare (Teatro Vivo); Aladdin (Hazlitt Theatre); Twelfth Night, The Comedy of Errors & The Importance of Being Earnest (Oxford Shakespeare Company); Jack & The Beanstalk (Millfied Theatre) Headlines (Battersea Arts Centre); Sleeping Beauty (Georgian Theatre Royal); Jack & The Beanstalk (Prince of Wales Theatre, Cannock); The Jungle Book (Birmingham Stage Company); The Two Gentlemen of Verona (Greenwich Playhouse); Plebians Rehearse the Uprising (Arcola Theatre); Macbeth & The Taming of the Shrew (British Shakespeare Company); Hamlet & As You Like It (Groundlings Theatre Company); Scar Tissue (Man In The Moon Theatre). His television credit includes: The Golden Hour (ITV). 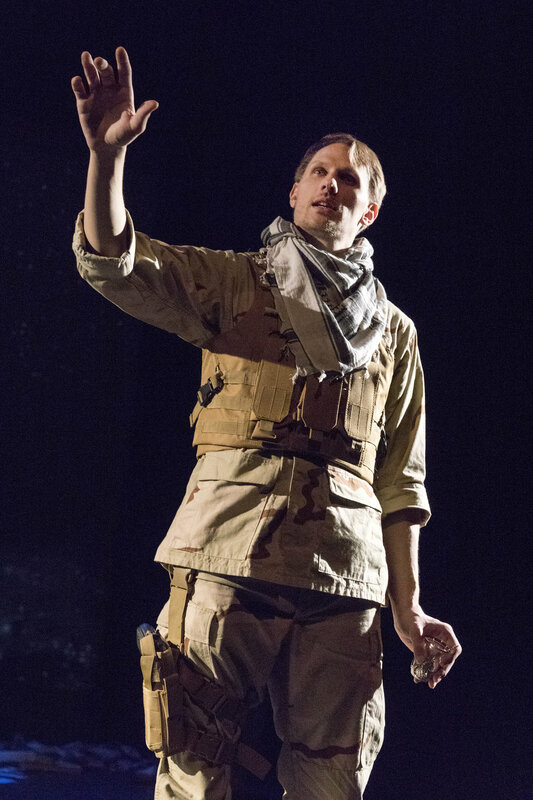 John M. Meyer (U.S. Army) (Performances: NC, VA, KS and BAM) Much of John's work draws on his experiences as an Airborne Ranger serving in both Iraq and Afghanistan. He is an artist studying at the University of Texas at Austin. He last appeared off-Broadway in Sophocles' Philoctetes with Aquila Theatre. His work as a playwright-performer has been featured in the Austin Chronicle, The Austin American-Statesman, KUT radio, and the BBC online. His stage-play American Volunteers won the 2010 Mitchell Award at the University of Texas and made the long-list for the Dylan Thomas Prize in the United Kingdom. Ross (The Eagle Theatre), Cat On a Hot Tin Roof (Oldcastle Theatre), and The Motherf***** w/ the Hat (Roxy Regional Theatre). He also has a world-changing Kermit the Frog impression. Tyler La Marr (U.S. Marine Corps) served as a Sergeant in the United States Marine Corps from ’04 -’10 for two tours in Iraq (’06 -’08) with 2nd Radio Battalion based out of Camp Lejeune, NC. He began pursuing his acting career in 2009 while still in the Marines by taking classes and acting in multiple independent films in the Maryland/DC area. After finishing his service in the Corps he then headed to New York City for some formal training and earned his BA in Theater Performance from Marymount Manhattan College. After graduation he was cast as the lead role in the national tour of Basetrack Live, which went on to be named one of the NY Times 10 Best Theater Shows of 2014. He recently returned from London where he earned his Masters in Acting from Drama Centre. He is also the co-founder of The Society of Artistic Veterans based in NYC. Visit tylerlamarr.com for more. 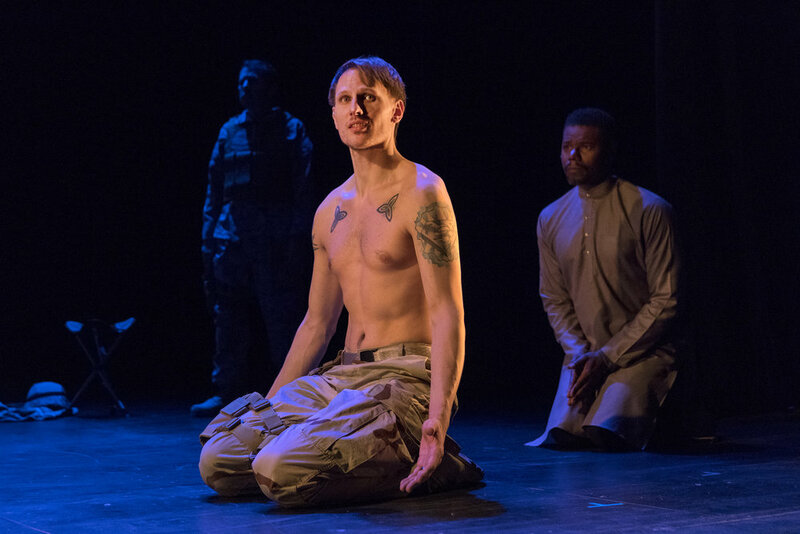 James Stanton (U.S. Air Force) is a 2014 graduate of the Hunter College Department of Theatre’s Master of Arts. He was a recipient of the CUNY Vera Roberts Fellowship for his play A Fortnight at Tripler. His short plays The Sun Also Sets and Not On My Watch...! were produced at Manhattan Rep last year. Most recently he performed in Aquila Theatre’s Philoctetes, The Public’s production of Twelfth Night in Central Park’s Delacorte, Shields of Blue at the Midtown International Theatre Festival and Frog & Peach’s production of MacBeth at the Sheen Center. A native New Yorker, Colonel Stanton is a Gulf War combat veteran who served in the Air Force as a fighter and bomber pilot, commander, accident investigator and strategic international analyst. He is now an actor, playwright, attorney, alternative dispute resolution mediator, and an administrative law hearing officer for the City of New York. Ryan Wuestewald is thrilled to join this cast and company. Credits include Third Rail Projects’ Sweet and Lucky (Commissioned by the Denver Center for the Performing Arts), Jackie & Me (Denver Center for the Performing Arts), Metamorphoses (Aurora Fox), How the World Began (BETC Regional Premiere), Failure: A Love Story, (Catamounts), It’s Only a Play (Hawaii Theatre), The Propagation of Light in a Vacuum (10 Days Festival: Tasmania, Australia), Watershed (LIDA Project), The Shape of Things (AWS Theatre Co.). He will be working again with Third Rail Projects on a new full-length work set to open this summer. Training includes an MFA in Acting from the University of Hawaii and the Oregon Shakespeare Festival Intensive. Desiree Sanchez (Director and Adaptor) Directed and adapted this year’s production of Much Ado About Nothing for Aquila’s national tour. Past productions include: Romeo and Juliet, The Adventures of Sherlock Holmes, and Philoctetes for the 2015/2016 season; The Tempest and Wuthering Heights for the 2014/2015 season; Twelfth Night and Fahrenheit 451 for the 2013/2014 season; A Female Philoctetes at BAM Fisher's Hillman Studio, The Taming of the Shrew, and Cyrano de Bergerac for the 2012/2013 season; Macbeth and The Importance of Being Earnest for the 2011/2012 season; and Six Characters in Search of an Author for the 2010/2011 season. Other productions include Herakles at BAM in March 2013 and the Festival of the Aegean in Syros, Greece and the Michael Cacoyannis Foundation in Athens in July, 2012. She created movement for Aquila's A Very Naughty Greek Play (Aristophanes' Wasps), Catch-22, Julius Caesar, The Iliad: Book One, and The Comedy of Errors; performed in The Iliad: Book One at the Festival of the Aegean in Syros, Greece; and was the lead teaching artist for Aquila's Shakespeare Leaders program in Harlem. Desiree had a twenty-year dancing career including working as a principal dancer for the Metropolitan Opera Ballet where she worked under the direction of numerous directors and choreographers including Francesca Zambello, Mark Lamos, Doug Varone, John Dexter, Franco Zeffirelli, Julie Taymor and Andrei Konchalovsky. Other companies and choreographers she has worked with include the Boston Ballet, Neo Labos Dancetheatre, Donald Byrd/The Group, Sean Curran, Gelsey Kirkland, Bill T. Jones, Heidi Latsky, Eun Me Ahn in Korea, and Robert La Fosse. She performed for the Papermill Playhouse as a featured dancer in the musicals Carousel and The King and I. She has also taught at Long Island University as a visiting associate professor of dance, and has a Certificate of Movement Therapy from The New School. Peter Meineck (Adaptor and Translator) holds an endowed chair at New York University as Professor of Classics in the Modern World. He founded Aquila in London in 1991 and now serves on Aquila’s board and directs the humanities programs. He has produced/directed over 50 productions of classical drama all over the world and published widely on ancient drama and cognitive theory, including several translations of ancient tragedy and comedy. Recently he edited Combat Trauma and the Ancient Greeks with David Konstan (Palgrave) and his new book, 'Theatocracy: Greek Drama, Cognition and the Imperative for Theatre,' will be published by Routledge in June. He was educated at University College London, the University of Nottingham (PhD), is Honorary Professor of Classics at Nottingham, as well as served in the UK Royal Marines Reserves. He now serves as a rescue captain, volunteer firefighter and EMT with the Bedford Fire Department in New York. John Meyer (Collaborating Writer) See cast bio. D. Franklyn Murphy (U.S. Marine Corps) (Collaborating Writer) is a former U.S. Marine who works in New York City. His work has appeared in Nine Lines Magazine and Wrath-Bearing Tree. Jenny Pacanowski (U.S. Army) (Collaborating Writer) is a poet/combat veteran/facilitator/public speaker/actor/curator. She collaborates with Impact Theater, Intersections International, One Fight Foundation, CUNY, Ithaca College, Syracuse University, Poetic Theater Productions, Bedlam Outreach, The Military Resilience Project along with many other organizations. In this past year, Jenny has founded and is the director of Female Veterans Empowered to Transition (FVET) which is held at Camel’s Hump Farm in Bethlehem, PA. 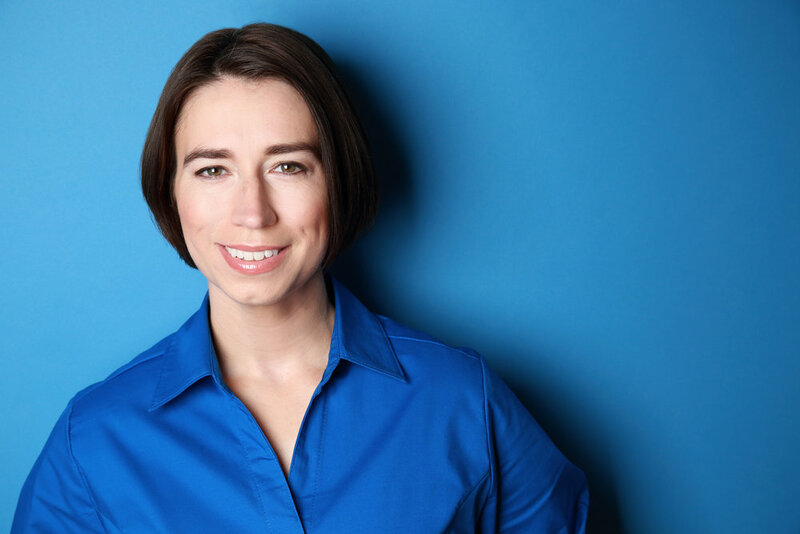 Most recently, Jenny has performed at the Lincoln Center Atrium, The New York Cultural and Ethical Society, Poetic License: Kicking down Doors, Veterans Special at the Lucid Body House, LaGuardia Community College Veteran Week, and Aquila Theater@ GK arts center. She has been published in “Reflections; Public Rhetoric, Civic Writing and Service Learning,” “Journal of Military Behavioral Health,” “The Indypendent, online magazine,” “The I’mpossible Project,” and many more. 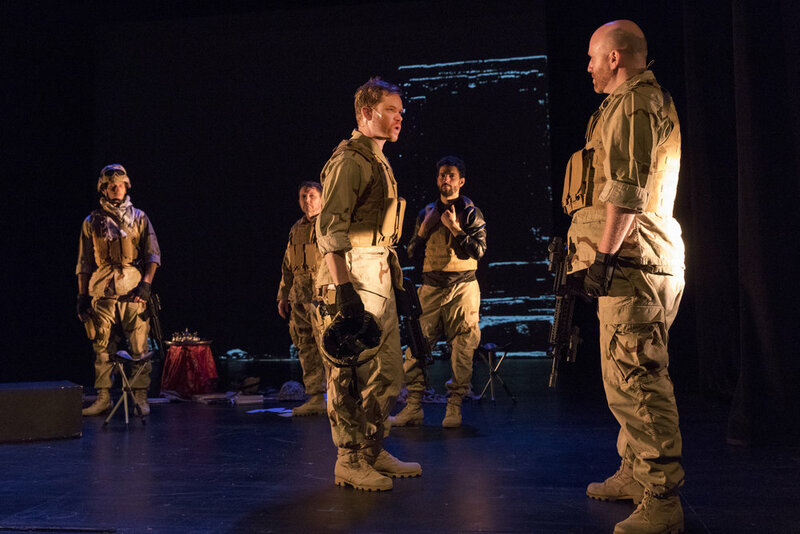 Jenny’s goal is to help veterans and civilians by healing the wounds of war and military culture through the arts. Jenny, who served as a combat medic for medical support convoys in Iraq, hopes that creating smoother reintegration programs will facilitate lowering the rates of suicide, homelessness, and addiction epidemics that plague our veterans. Dave Tennent (Projections Designer) creates interactive video installations, custom theatrical software, and projections designs for theater. 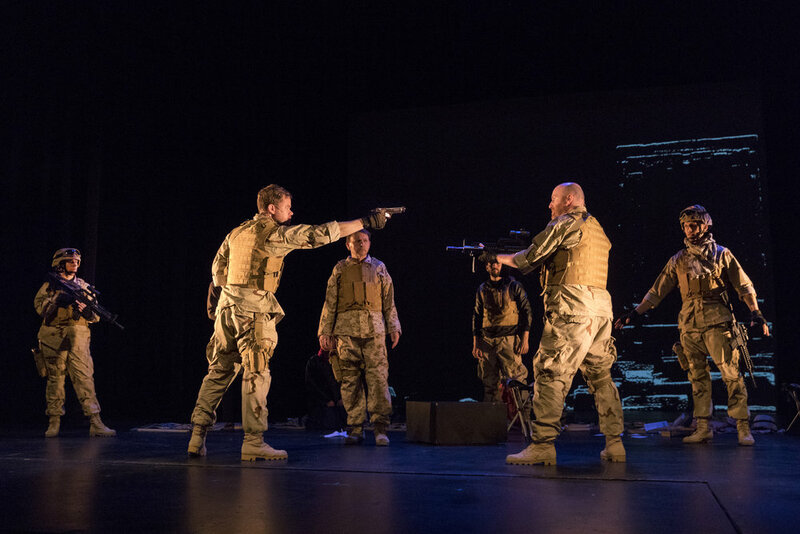 Off-Broadway and Downtown: Hamlet In Bed (Rattlestick), AZAK (Rising Phoenix, Rattlestick) Love Machine (Incubator Arts Project); La Ruta (Working Theater); P.S. 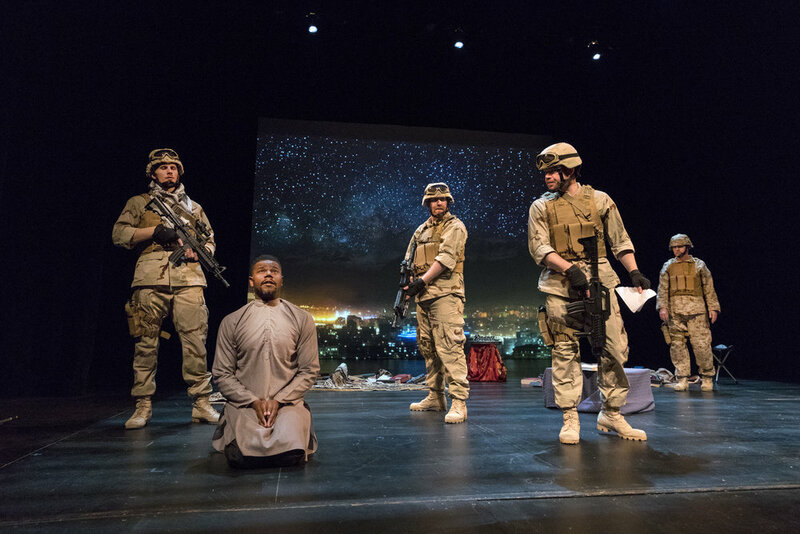 Jones and the Frozen City (New Ohio); Bullet For Adolf (New World Stages); How to Break (HERE); The Language Archive (Fordham); Chimera (HERE, Under The Radar 2012). Regional: Posterboy (Williamstown) Interior Designs (NJPAC, Jersey Moves); Pinkolandia (Two River Theater);Twelfth Night (Aquila Theatre); The Clean House (Syracuse Stage); Holiday Review (Oregon Ballet Theater). Associate Projections: Sweet Bird of Youth (Goodman Theater, Chicago); Crowns (Goodman Theater, Chicago). Dave has taught projections workshops at Syracuse University, New York University, and Harvard University. This is his fourth show with Aquila Theatre. Joel Moritz (Lighting Designer) is excited to be working with Aquila Theatre for the first time. Recent New York/ Off Broadway: AZAK, Undeniable Sound of Right Now, A Fable, Scarcity, Yosemite, and Post No Bills with Rattlestick. 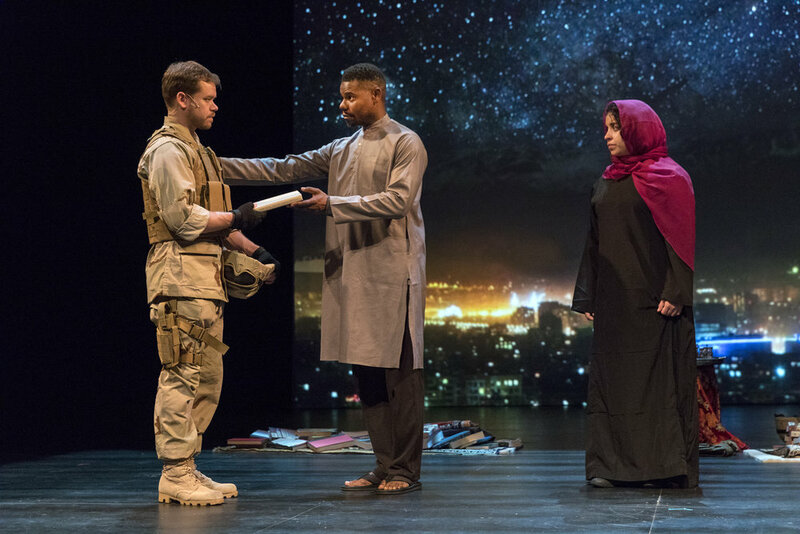 Slipping and Too Much Memory with Rising Phoenix Repertory and NYTW. Blue Man Group: the production and lighting design for the BMG at Universal Studios and BMG National Tour, as well as productions in Tokyo, Berlin, Oberhausen, Amsterdam, Zurich and Sydney. 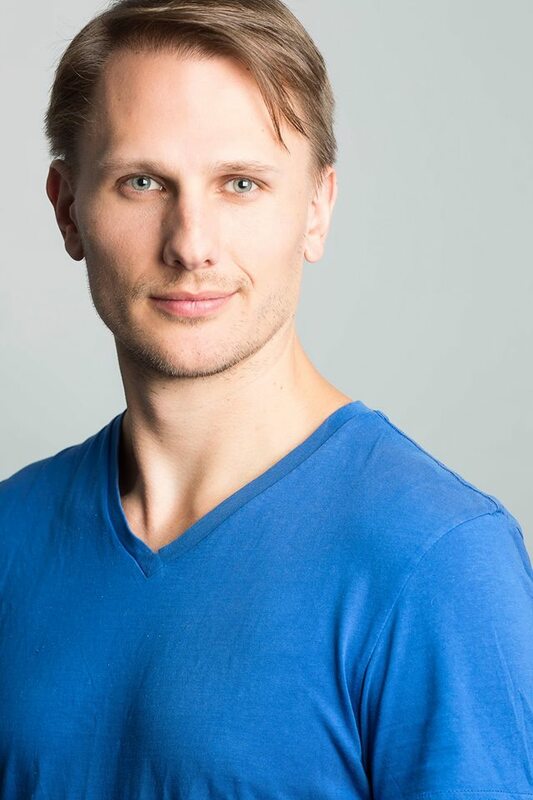 Joel has worked extensively in regional theatre and internationally with productions in Edinburgh, Buenos Aires, Lima, Hong Kong, Paris, Prague, and Cairo. Andy Evan Cohen (Sound Designer) has composed music and designed sound for theater productions all around the world. Credits include NYC off-Broadway In Bed With Roy Cohn, A Midsummer Night's Dream, and Ay Carmela! 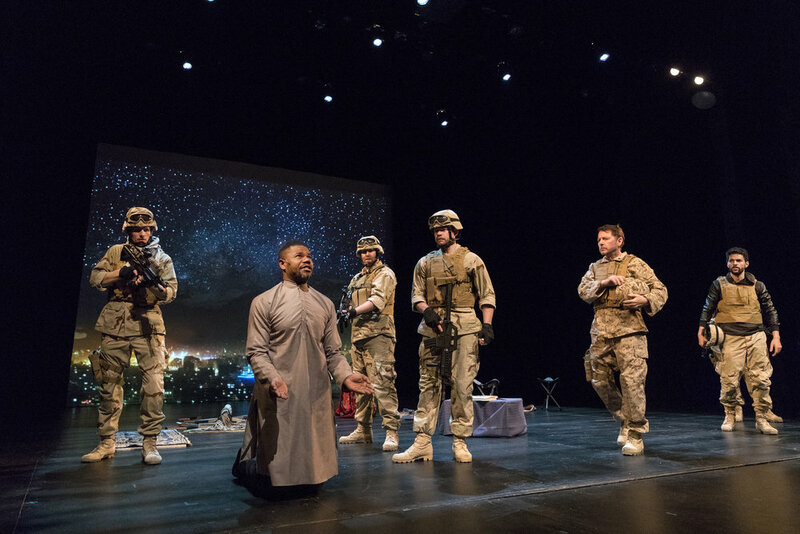 ; The American Soldier (Edinburgh Fringe, US Tour, Kennedy Center); The Hungry Hungry Games (US and Canada Tour); and multi-media installations at Werdenberg Castle, Switzerland. Recent work includes scores for the indie film Show & Tell Tango and a performance piece in New Zealand. Education: Oberlin and Manhattan School of Music. Neath Williams (U.S. Navy) (Military Consultant) served as a Hospital Corpsman in the United States Navy from 1999 - 2009, completing three combat tours in Iraq; he continues his service in the Navy Reserves, attached to 2nd Battalion 23rd Marines. After leaving active duty, Neath enrolled to Old Dominion University to pursue his passion for the arts. In 2010, after his experiences onstage at ODU, he moved to New York City. In 2013 he received his Bachelor's of Arts in Interdisciplinary Studies with focuses in theater arts, international studies, and writing for the stage from Marymount Manhattan College. It was during this time that Neath, along with classmate and former U.S. Marine Tyler La Marr, co-founded The Society of Artistic Veterans, which provides educational and other opportunities for military veterans who are pursuing professional careers in the arts. Shae Candelaria (Production Stage Manager) Previous productions include Smokey Joe's Cafe, Crazy For You, All Shook Up (regional), A Christmas Story: The Musical, How The Grinch Stole Christmas (national tours), My Fair Lady (Singapore tour), and Off-Broadway productions of That Golden Girls Show! and The Goldstein Variations. Shae holds a BFA from Abilene Christian University. Joshua Shain (Production Manager) works with a wide variety of artists; recent collaborators include: Perry Street Theatricals, The Battles Musical LLC., BEDLAM, Working Barn Productions, New Light Theater Project, LiveSource, Pipeline Theatre Company, Colt Coeur, New Saloon, New York Shakespeare Exchange, Chautauqua Theater Company and BAM. Joshua is currently the Assistant Production Manager at BRIC, where he facilitates multidisciplinary work at BRIC House and, in the summer, advances the BRIC Celebrate Brooklyn! festival at the Prospect Park Bandshell. Robert Rogers (Technical Director) has been involved in Technical Theatre for over ten years. His most recent endeavors include Production Manager/Technical Director for Penobscot Theatre, Technical Director for Gretna Theatre, and Technical Director for Aquila’s 2016 Spring and 2014-15 Tour Seasons. He has also been involved with everything from Assistant Tent Boss for the Zerbini Circus to a Chief Pilot of Maintenance at a $2.5 million dollar helium balloon in Tennessee. Additionally, Bob spent time in Qinhuangdao, China where he was Technical Director for an international cooperation project for the theme park show Snow White’s Birthday Adventure! Perry Street Theatricals (General Management) David Elliott, Martin Platt and Lorna Mulvaney. Perry Street Theatricals is a multi-award winning Producing and General Management Company. General Management: Georgie (Davenport), Sense & Sensibility (Gym At Judson), Hamlet and Saint Joan (Lynn Redgrave), New York Animals (New Ohio), That Golden Girls Show! A Puppet Parody (DR2), Missed Connections (New Ohio), My Life is a Musical (Bay Street), In Bed With Roy Cohn (The Lion), Ethel Sings (Beckett), WikiMusical (NYMF), Mapmaker’s Opera (NYMF), White People (Atlantic).